What to serve with that succulent lamb this Easter? Try our wine selections with an Easter theme. Photo courtesy of the American Lamb Board, which has a database of lamb recipes if you need cooking inspiration. 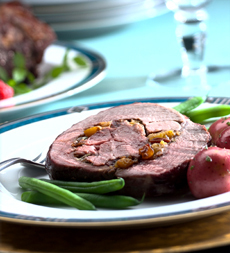 Above, Caramelized American Lamb Roast with Apricot Cranberry Stuffing. KRIS PRASAD is Wine Editor of THE NIBBLE. Email Kris with questions and comments. EDITOR’S NOTE: This article was written several years ago, featuring the vintages of that time, listed below. You won’t find these vintages any more, but the current vintages are equally delightful for your Easter feast. CAPSULE REPORT: What’s a holiday feast without a good value wine? We’ve married grape to history with his recommendations for your Easter dinner. Whether your main course is lamb, ham, beef or poultry, these affordable red wines are not only tasty, they’re clever: you’ll have an anecdote to share with your guests as they taste and comment. What wine will you be serving with that Easter lamb or ham? You need a medium-bodied red wine. Here are three wines with religious significance that should be on your table. Depending on when you read this, the vintages may change....but the sentiment remains the same. *An earlier pagan version attributes the blossoming of the first ever vines to the tears of Bacchus. Tasting notes from the 2004 vintage: Our choice of Lachryma Christi for Easter dinner, the 2004 red by Mastroberardino, is only partly based on its seeming appropriateness within the context of the holiday. It actually does have an affinity for lamb dishes, particularly baby lamb with lemon-egg sauce, which is one of many traditional recipes served on Easter Sunday in southern Italy. The wine has a slightly tart red cherry flavor with excellent grip and depth. It finishes dry with an aromatic aftertaste. 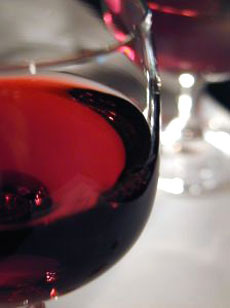 The grape variety is mainly Aglianico, one of the noble red grape varietals of Italy (along with Nebbiolo and Sangiovese). If you can’t find the Lachryma Christi, either substitute another producer or look for Tenuta le Querce “Il Viola” Aglianico del Vulture 2003 (about the same price), a personal favorite of ours. It is bold, bright and incredibly delicious. The wine is from the Basilicata, a region that adjoins Campania, and all it lacks is the legend (but you can have a good time with the “vulture” association). The religious link to our second wine choice is to Joseph of Arimathea, canonized by the Catholic Church in the Middle Ages, who was allowed to remove Christ’s body from the cross and bury him and was supposedly present at the time of the resurrection. According to the Gospels, Joseph, a man of wealth, was the person who donated his own prepared tomb for the burial of Jesus after his crucifixion. What’s the relationship to wine? This is the Saint Joseph for whom the great northern Rhone wine appellation is named, a west bank appellation producing mainly red wines from the Syrah grape and also some white wines from Marsanne and Roussanne. The doubly-aptly-named “Offerus” is a wonderful Easter offering. Tasting notes from the 2003 vintage: Chave’s 2003 “Offerus,” is amazingly supple and composed in spite of the torrid heat of the 2003 vintage. Rich with aromas of blackberry, currants and nutmeg, the wine is medium-bodied with supple flavors, an enticing melange of fruit on the palate and a very, very satisfying finish with a hint of herbal aftertaste. Pair it with both lamb and beef. For its more luxurious sibling, try Chave’s Estate Bottled Saint Joseph, which is around $55. It’s richer and more complex, with leather and spice and fragrance surrounding the intense fruit. The Offerus is made from purchased grapes whereas the Estate Bottled is made from grapes grown in the domaine’s own vineyards. Photo by Philippe Ramakers | SXC. A Greek wine for Easter? There are important connections: The very word Christ is the Greek equivalent of the Hebrew word Messiah, “the Anointed One.” Paul the Apostle spread the gospel throughout Greece. Refosco is a grape variety indigenous to the Friuli region of northern Italy (we will see more of as it is undergoing a revival in Friuli). In 1870, Theodore Mercouri imported Refosco cuttings and planted the first vineyard in the western Peloponnesian Mountains. This wine has velvety tannins and uncomplicated fruit flavors, which are more in the red cherry spectrum with dry herbal flavors. It should pair well with lamb. Foodie trivia note: The region is known for its currants—the Mercouris also grow them—and the word “currant” derives from the nearby port of Corinth, from where the currants were shipped. May the Easter Bunny bring you a large basket filled with delicious wines!